It’s February, and despite the recent dip that we’ve been experiencing, it’s a better time than ever to invest in the cryptomarket. Any veteran crypto investor will tell you always to buy the dip, and this is the lowest that the market has been in months. That means the potential for big returns in the coming months is huge. However, market downturns like these can steamroll small ICO’s that don’t have any lasting potential. This is what stops a lot of people from investing during these troubling times. You should never stop investing, though. The trick is just to invest smarter. You need to invest in ICO’s that have real-world applications and solve actual problems, instead of just providing another digital wallet. So with this in mind, we’ve put together a list of the best ICO’s that have a real potential to explode in the coming months. Let’s take a look. These guys have a really interesting business model. They want to fix the auto industry. For decades, the price of cars has skyrocketed and along with it, the price of automotive engineering, repair, and even cab fare. The reason that prices for these services are so astronomical now is that everything is centralized. There are a few leading companies who control vehicle and auto parts distribution, and whatever price that they charge dictates everything else in the market from insurance prices all the way down to how much you pay for your tires. VLB wants to fix these problems with the blockchain. They want to create a decentralized platform for people to buy and sell cars, create ride-hailing services (like Uber), and to connect to automotive repair centers. This will take power out of the hands of the banks and large companies, and put it back into the hands of the people. GoNetwork was created by three friends who’ve had a career in the gaming industry. They want to solve Ethereum’s scaling problem by allowing off-chain transactions. Right now, what’s holding Ethereum back from scaling as much as it should is the fact that it can only process 8 transactions per second. 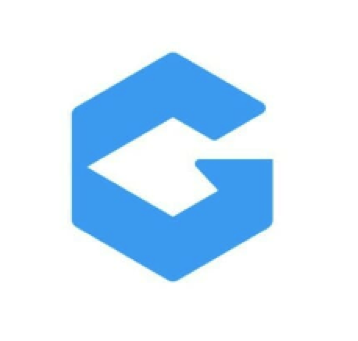 GoNetwork seeks to reduce the current strain and long transactional times by allowing people to transfer cryptocurrency via peer-to-peer connection off of the blockchain. Unlike most ICO’s Rentberry has been around for a little while and has built an excellent reputation. They’re trying to make home and apartment rental easier than ever. Rentberry is using blockchain technology to automate all of the tedious bureaucratic processes. They want to make it easier than ever for property owners to rent out their homes, and easier and cheaper for tenants to move in. They are going to allow members to fund each others security deposits in return for rewards. Node is harnessing the new wave of energy technology; wireless charging devices. Their first prototype is a wireless phone charger, and from there they are planning to expand into the industrial, medical, and automotive industry. They have big plans, and with the recent success of their prototype, they are set to skyrocket over the course of the next year as more and more companies are adapting to wireless charging technology. SociFi wants to provide free data to the world. They plan on doing this by making large global companies pay for it. All over the world, there are people who have smartphones, but who either can’t afford or don’t want to pay the exorbitant prices that most service providers charge for data.Basically, users would download the SociFi app, and they would be given the opportunity to view advertisements and media that is related to a large company such as Coca-Cola.. 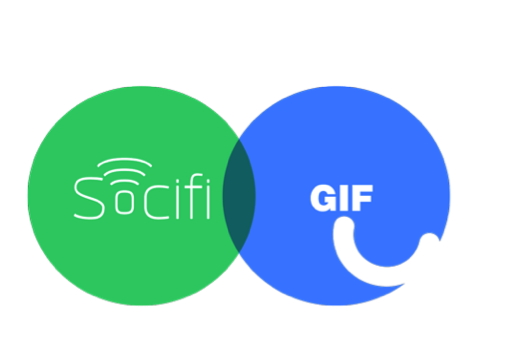 In exchange for interacting with the media, the company would pay for a certain amount of free data for the SociFi user. Not only does this bring internet and data access to underprivileged areas, but it also provides a whole new outlet for multi-billion dollar companies to advertise. SociFi already has a successful business model and has done the same thing with WiFi in the past few years. They also already have the support and backing of Pepsi, Coca-Cola, Uber, Windows, and Nuevo Pudahuel. Don’t let this rough market turn you away! Take advantage of the sales while they last because we guarantee that they won’t be around forever. This year is going to one of the biggest years in the cryptomarket yet, and the prices are only going up this summer. Don’t be the last one to board the train! When Bitcoin was developed, it had problems in regards to privacy and transaction speeds. While its possible to create privacy-centric elements to it, it’s not easy and requires a hard fork for it to happen. Bitcoinprivate is a hard fork between Bitcoin’s algorithm and Zclassic’s advanced privacy features. Specifically, it will use z-snarks to remain private. We’ll introduce you to this new cryptocurrency and how you can benefit from using it today. What are The Advantages and Disadvantages of BTCP? Bitcoinprivate is a peer-to-peer network that specializes in private and decentralized transactions. As a result, there are no intermediaries needed to when conducting trades with this coin.The transactions are verified via nodes before they are sent to miners for their approval. Since it has a larger block size, and peer-to-peer capabilities, it’s designed to scale. This means that the more users who are on Bitcoinprivate’s network, the more effective it becomes. Some new cryptocurrencies are premined, which can leave new users at a disadvantage. 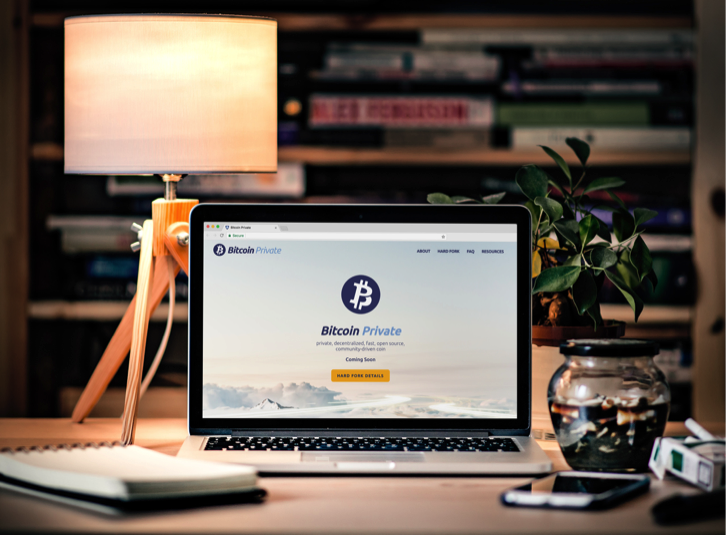 Bitcoinprivate is released in a fair manner for its entire userbase. The coins will be sent out on a 1:1 basis to ZCL (Z-Classic) and BTC (Bitcoin) holders. Plus, bitcoinprivate’s codebase is open for verification and viewing by everyone. This allows for experienced programmers to find existing problems within its system, and fix and create changes within them. Rest assured that Bitcoinprivate will be maintained protected by an ever-growing community. Its main disadvantage is its large block size. Even though its block size is 2MB (in comparison to BTC’s 1MB block size), this means that it will take longer for miners to process it. The larger block size will take up more bandwidth, which can lead to more energy costs in the long run. What makes BTCP So Special In Comparison to BTC and BCH? Now, we can see the noticeable differences between Bitcoinprivate, Bitcoin, and Bitcoin Cash. While it does have a larger block size than Bitcoin, it has the highest level of privacy out of the three. Because of that, users should look into Bitcoin private as it provides a safer network that conducts faster transactions and keeps each user’s information protected while it’s in use. What makes Bitcoin Private so special? Not only is it forked by Z-cash, one of the most private cryptocurrency networks in the market, but it’s also backed by Bitcoin’s existing algorithm. This means that it is a reliable coin to invest in due to its owner’s previous history, and its future growth potential. Do you have any additional questions regarding Bitcoinprivate? An initial coin offering (ICO) is a form of crowdfunding that only uses cryptocurrency. They are used to give capital to growing startups. ICOs are created when a startup pre-allocates their own cryptocurrency (referred to as tokens) to investors. Investors can buy for the tokens with popular cryptocurrencies such as Bitcoin and Ethereum. You’ve probably heard the term before, but there are some ICOs within the few years that have gained popularity and have been used by investors worldwide. Ethereum is a prime example a popular ICO that’s been created. Back in 2014, it raised up to $18 million in BTC, which is about 40 cents per ether. After a growth spike, Ethereum now has a market capitalization of $63 billion and traded at a price of $660 per coin. One ICO gained $150 million in funding within three hours, and over $1.3 billion raised overall in this year alone. ICO sales have doubled from about 1.5 sales a week in 2016 to over 2.75 in 2017. The first cryptocurrency that has been funded via an ICO was Ripple. In 2013, a company called Ripple labs developed the Ripple Payment System and made about 100 billion XRP tokens. Afterwards, the company sold the tokens to aid in developing Ripple’s platform. There have been several extra cryptocurrencies that were funded by ICOs. For instance, Mastercoin was made with the purpose of tokenizing Bitcoin and to execute smart contracts. Recently, there are over 400 ICOs within the cryptocurrency market. 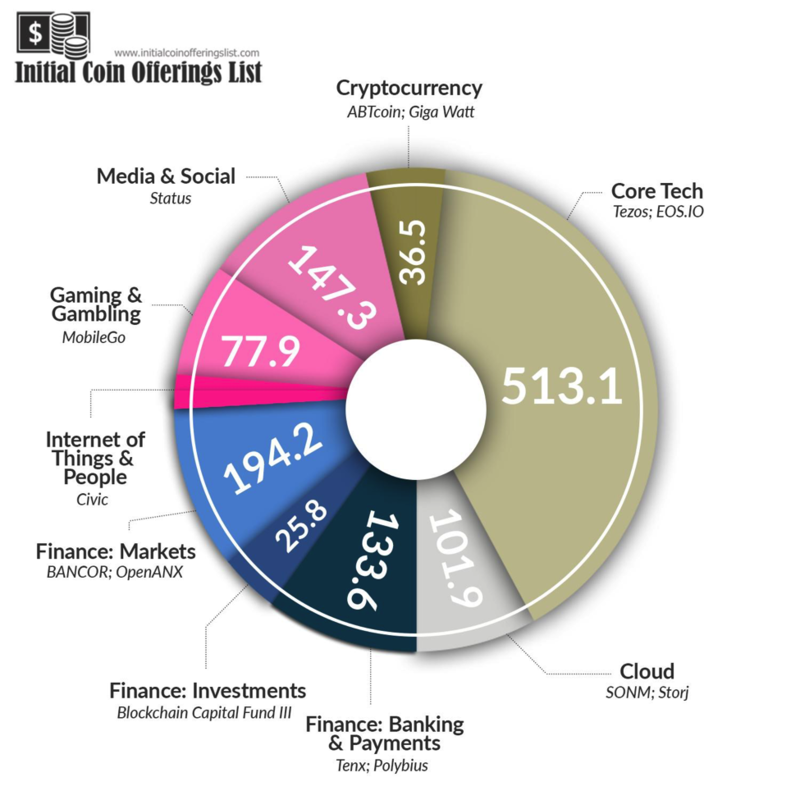 This image shows the amount of percentage of categories that ICOs are invested in. Due to its flexibility, ICOs can be used for almost anything! Many analysts believe that ICOs are perfect for those wanting to receive long-term profits. Here are some advantages that make ICOs a worthwhile investment. As long as the cryptocurrency exchange remains functional, tokens are more liquid than traditional stock trading options. Crypto markets are transparent. This means that you can see the asset price of your ICO token in real time. With stock options, you can only trade during the weekdays. But what if the value of your stock decreases highly during the weekend? This can be dangerous if you leave your account on for too long, and you’ll be unable to sell the stock when it reaches too low. With ICOs, you can sell and trade them for different tokens at any time! While cryptocurrencies is a volatile market, it allows you to exit and close positions whenever you need it. Because of this reason alone, ICOs have more liquidity than fiat currencies, forex trading, ETFs, stocks, and commodities. One of ICO’s main advantages is that each of the tokens can be bought at a low price. Most cryptocurrency exchanges begin to sell these new ICO tokens for profit once their project starts showing signs of completion. For example, Ethereum tokens have increased in value in a large magnitude. Analysts have noticed its growth from 3 to a $698 within 3 years. When you invest in ICOs, you have the chance of making a large profit if your coin starts to increase in value dramatically. Still, some skeptics are still apprehensive about the future developments of ICOs as a market and as a trading option. Here are some disadvantages that you should look into before you begin trading. On most occasions, ICOs have a whitepaper or some code to show what the project will look like once it is finished. But, there isn’t a guarantee that the project will ever reach its final stage or have the mainstream appeal to be used by millions of new people. You’ll have to understand that there is some risk associated with ICOs. It can take years until there is an actual market for the token you placed your investment on. Remember, invest with risk and only on the ICOs that you believe are great for long-term growth. Backers only have a financial stake in the ICOs they invest their capital in. However, they are unregulated and unregistered within the cryptocurrency exchange market. This means that you won’t be reimbursed if the project fails or is discontinued. This is a small issue that most investors tend to overlook. Fortunately, it’s becoming less of an issue because smart contracts can be used to lock ICO funds to increase the legitimacy of each project. How to Buy an ICO Token? How many backers are funding the token? Does the company seem normal or are they showing signs of a scam? How much am I willing to invest in this ICO? Where can I see this ICO being used outside of its token? Once you find the answer to these questions, start investing in the ICO that appeals to you the most. Following these steps will ensure that you’ve made a safe investment and will help you determine the good ICOs from the ones that show no signs of growth. Overall, ICOs are good for long-term traders who have faith that the cryptocurrency market will grow. While not all ICOs are made equal, you can gain a lot by dedicating time, research and a bit of income in it. To conclude keep applying your investment strategies and skills to make sure that you gain the most returns from ICOs by becoming a well informed and careful investor! For research purposes keep an eye on 101trading.co.uk. We are going to publisch alot of content about ICO this coming year. Learning how to buy and sell Ethereum on an established broker is easier than ever. Cryptocurrency is a booming market with lots of opportunities for the experienced trader. With Plus 500, new traders can get started and join in on the multiple benefits of this new economic market. If you think that Ethereum is just a currency, you’re highly mistaken. The Ether is a revolutionary addition to the crypto market and serves as a worthy alternative than Bitcoin. Ethereum is unique because it’s currency creates a system where anything can be programmed. For instance, you can use ethereum to make secure contracts. These contracts can be used to fund startups faster than traditional incubator programs and venture capitalists. Because of this, it’s likely that Ethereum will share the same level of success as bitcoin and you can benefit from this as an investor. When first-time investors try to place Ethereum in the same line as bitcoin, they tend to miss out its utility. While they are both digital coins, they have huge differences. Ethereum’s major advantage is that it can be used for all sorts of projects. Bitcoin and Litecoin are viewed as currencies and can be traded online to receive products and services in a decentralized manner. However, you can do a myriad of things with Ethereum. Did you know, that you can use Ethereum to create a political system or issue shares with the currency? With ethereum, it’s not mutable; This means that once the contract is made, the contents within it cannot be changed. As a result, Ethereum is powerful against malicious hackers who attempt to steal data from the contracts. Ethereum’s increased security increases its long-term growth potential and shows signs of the price possibly increasing further. That’s why we’re going to teach you how to buy and sell ethereum so you can get in on the market while you still can. Start off by creating a demo or real account with Plus 500. Click Cryptocurrencies and scroll down to Ethereum (Alternatively: Click “Search our Instruments” on the top left of the screen and type Ethereum). 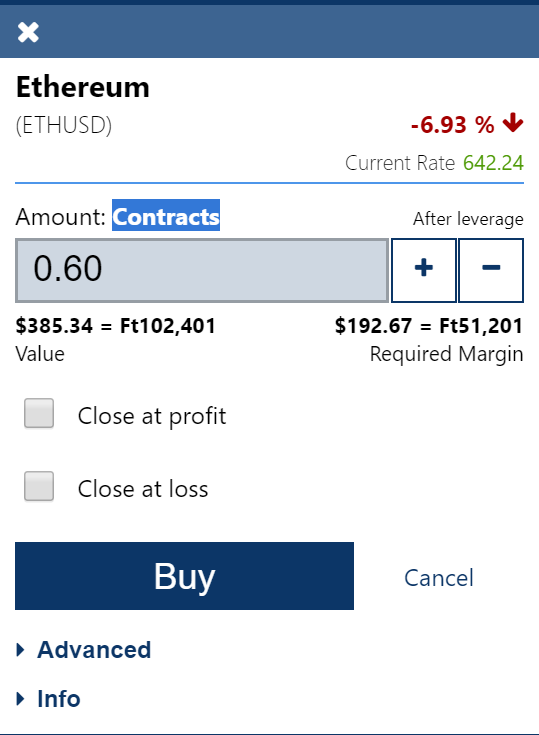 Set the price that you want to buy Ethereum at and press BUY. 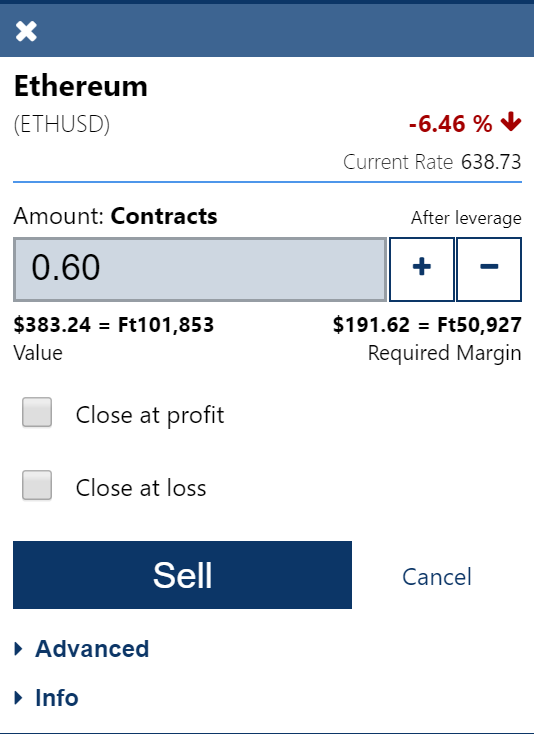 To sell ethereum, click the SELL button to close the position and sell your position. To buy and sell ethereum more effectively, you have to set a stop-loss and a stop-limit. Stop losses will help by automatically selling the position if its value reaches below a certain value. For example: Let’s say that Ethereum has a value of $600. Making a stop-loss of $400 ensures that you can sell the position once it reaches this value. Doing this allows you to minimize your losses so that you don’t lose too much money investing in ethereum. With a stop-limit, you can make quick profits off of ethereum. Going off our previous example, Ethereum has an initial value of $600. When you set up a stop limit of $800, it will close the position once it reaches $800. This ensures that you receive a $200 profit once the position is closed. Remember, always trade carefully when using Plus 500. While using a stop-loss and stop-limit will help reduce your risks, you have to make sure you research what you’re investing. This allows you to trade and manage your own risk and prevents you from getting margin called due to blind investing. To conclude, Plus 500 provides a safe and user-friendly interface for investors to buy and sell ethereum. 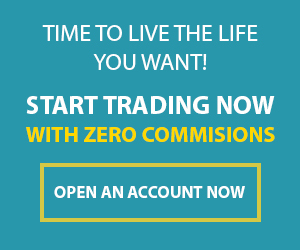 It allows you to open and close positions at any time and safely trade without your information being compromised. Start with Plus 500 today to break into the cryptocurrency market! Ever since its development in 2009, Bitcoin has been a highly debated topic of conversation. Whereas previously, it was relegated to deep web perusers and Reddit tech devotees, now it’s hard to be in any coffee shop whether suburb or major city for five minutes without its name being uttered like a resistance movement. For this buying and selling example, we’ll use Plus 500’s, a reputable online brokerage to help you start your investing journey. After hearing all these stuff, it’s time to find out on how to buy and sell bitcoin on Plus500. Plus 500 was founded in 2008 and is an online trading platform for financial investment options such as Stocks, commodities, ETF, and the Forex market. Recently, the platform has accepted the trading and selling of cryptocurrencies. The company operates in Israel and has regulated entities in Australia, UK, and Cyprus. It’s parent company Plus 500 Ltd, are found on the Alternative Investment Market on the London Stock Exchange. This means that it’s easily accessible and traders worldwide can use its platform and start trading. Plus 500 is more efficient than other online trading brokers because of its longevity. Since it’s been in use for almost a decade, it has a good track record and is a trustworthy platform to use. Because of this, it’s easy for people to buy and sell bitcoin and other cryptocurrencies within their network. Plus 500 doesn’t use their money for hedging; it doesn’t use their client’s money for this reason. Everyone’s money is placed in a segregated client bank account that follows the Financial Contract Authority’s rules for regulating client’s rules. It doesn’t create speculative positions with the client’s money or in the market. Plus 500 doesn’t have exposure to sovereign or foreign debt. Retail client’s money is not invested in other markets. Due to their strict rules on trading and protecting their client’s assets, Plus 500 is safe for users to buy and sell bitcoin. It’s a trading broker that follows all financial rules and regulations. As a result, it’s user base rise up to 105,000 users making up most of UK’s participating investment market. You can find out more about Plus500 here. How To Start buy and sell bitcoin on Plus500? Click “Real Money.” This allows users to use their bank account to open and close trades within the cryptocurrency market. Log onto Plus 500’s main menu located on left portion of the page. Click ‘Trade’ to receive a list of the tradable options that are available. Plus 500 has an advanced CFD trading brokerage software that allows users to trade forex, stocks, commodities, cryptocurrencies safely and efficiently. For example, you want to buy Bitcoin on. First, go to Trade > Crypto > Cryptocurrencies and find Bitcoin on the list. Alternatively, you can search Bitcoin from Pluss 500’s upper left corner that’s located next to the logo. Once you click on the Bitcoin row, the information about the cryptocurrency is located on the right of the trade option. Click buy after you find Bitcoin on Plus 500’s network. The trading position will be shown in the “Open Positions” section or on the Bitcoin option itself. You can find a more detailed info in our Plus500 Tutorial: How to open and close a trade at Plus500. Create a stop-loss and a stop-limit if you’re trying to trade more effectively and prevent having a loss on Plus 500. The stop loss will close the bitcoin position if its value goes a certain price number/percentage. For instance, when you open a bitcoin option at $2,000, you can create a stop-loss a $1,000 so that it closes the position. But what if you want to stop holding Bitcoin once you received a profit? Create a stop-limit so that you can sell your bitcoin once it exceeds your expected value. This ensures that you can automatically sell your bitcoin and is a great technique for both short term and long term traders. Still, it’s important that new investors learn how to buy and sell bitcoin. Its simple interface will help you easily find it and open a position. Ultimately, following our advice will help you invest more effectively and participate in the ongoing cryptocurrency market. For question about using Plus500, please put them in the comment box below. What are the benefits of this currency? On the 13th July 2015, I wrote a piece about why Bitcoin was going up in value. In the end the Bitcoin gain in value around +26% and in 2016 +119%! If you had bought the Bitcoin at the time that I had publish that blog then your ROI would be +300%. (the selling price at the moment was 269 USD versus 1100 USD today) In this blog I am going to share you my thoughts about Bitcoin 2017. Bitcoin 2015 – Bitcoin 2017: What has happend in the Bitcoin world? What has happend in the last past two years in the Bitcoin world? Well the begin with more and more stores are accepting Bitcoin. However Bitcoin is still not popular among consumers. But it is gaining more attention from consumers according to this article. In my opinion in the past two years three major things have happen in the Bitcoin world. Especially that last number three have been a big factor for the value increase of the Bitcoin of the past two year. With the slowdown in growth in the Chinese economy in particular, you saw that Chinese went into Bitcoin massive. Slowdown in growth means a weaker Yuan and because of that the chinese are investing in Bitcoin to protect their wealth. Bitcoin 2017 the new gold? In the last few weeks, the price of the Bitcoin Sky rocket. Mainly because of the weak yuan and the weak Venezuela currency. Currency investors look for a new safe haven. And it seems that for the Chinese & Venezuelan investors that Bitcoin is their safe haven. Why is Bitcoin so popular under the Chinese investors? One of the main reason is that the Chinese government are taking action to make it more difficult for the Chinese people to move their money overseas and invest outside of China. And with the continuation of the Yuan losing their value, the Chinese are looking for ways to protect their wealth. And one of the way of protecting their wealth is to invest in Bitcoins. Because unlike gold, you can use Bitcoins to buy other things where the government has no control on it. Bitcoin 2017: What is going to happen this year? will the currency break his ceiling of all time high? I think Bitcoin will continue to increase in value. Because the demand for bitcoins will increase while the supply of bitcoins becomes smaller. The reason for this is that bitcoin is a popular currency, which is still gaining more popularity. Off all the currency to invest in, the bitcoin has the potential increase in value faster then other currencies. With the Brexit, Venezuela & China’s capital outflow issues that is going on. 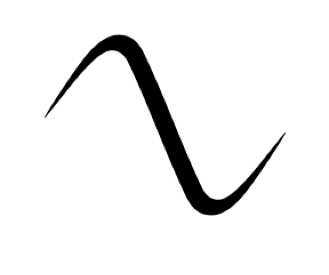 I am sure that the bitcoin will set new higher values then in 2016.